Sometimes, all it takes is a single note for a song to lasso my ears and elevate it to a “Wow, I really dig this song” level. It has to be pretty good to begin with, but that one, well-placed tone can make all the difference in capturing my attention. I like a lot of the tracks off the debut album by the three-man songwriting collaboration known as Middle Brother, but “Thanks for Nothing” is the one I find myself actively seeking out and playing over and over. And it’s all because of that third inversion chord. Did he put that much thought into that one note? I doubt it, but its timing and inflection are perfect. 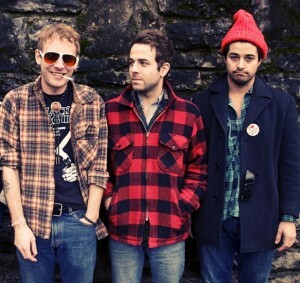 In addition to Goldsmith, who is also lead singer of L.A. folk-rock group Dawes, Middle Brother features John J. McCauley III of Deer Tick and Matt Vasquez of Delta Spirit. Having met each other as a result of their other bands doing several shows together, the trio decided to meet in Nashville and workshop an album in just a few short weeks. They evidently brought out the best in each other, because Middle Brother’s eponymous debut is an Americana feast of rousing roots rock and confessional folk ballads. “Thanks for Nothing” is one of the latter. Goldsmith describes himself shuffling along the streets of Nashville with his mind stuck on a girl in London (England, I’m assuming, though I suppose it could be Canada or even Arkansas). “None of it distracts me in the way I had planned,” he sings. “It doesnt bring me back my smile like I was hoping.” He can’t even bring himself to flirt with a pretty girl, and it’s all this English babe’s fault. From its simple harmonies to its tried-and-true subject, nothing about the song is particularly revolutionary, but its emotional turns and twists are perfectly executed. This entry was posted in Music, Racking Up Plays and tagged Americana, Dawes, Deer Tick, Delta Spirit, folk, folk-rock, Middle Brother, unrequested music theory lesson. Bookmark the permalink.